Tucker & Dale vs. Evil is a thoroughly entertaining and worthwhile adventure regardless of the amount of fermented plant in your system (so long as you can stomach a substantial amount of gore), but if you watch it drunk, it becomes phenomenal. The premise: Longtime friends Tucker (Alan Tudyk) and Dale (Tyler Labine) have just purchased a cabin in the woods for use as a vacation home, and are checking out the property for the first time. Simultaneously, a pack of young, attractive, carefree youths are camping nearby, and when the two meet through a series of unlikely and zany misunderstandings, a horror film results. 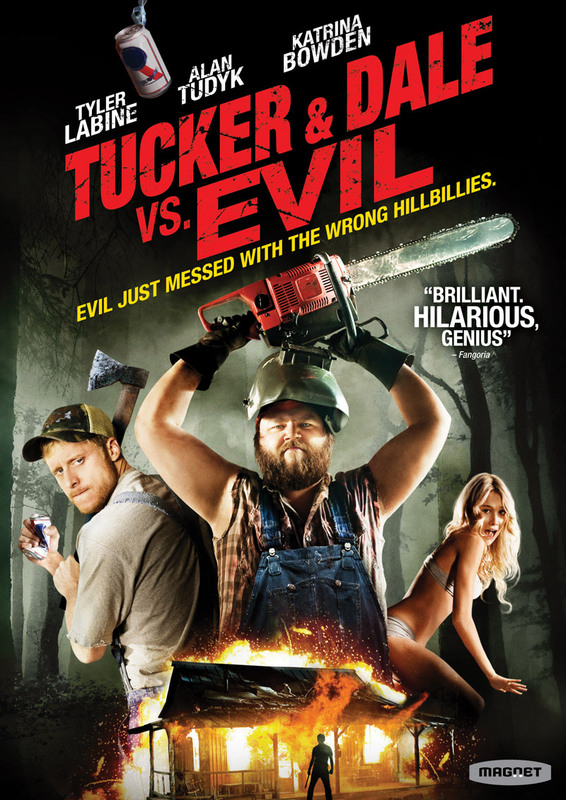 Really, it’s like watching two movies at once–the slasher film the teenagers are experiencing, and the dark situational comedy that Tucker and Dale find themselves suddenly trapped in, complete with excessive blood splatter. Why you should watch it: Or, more specifically, why it’s better to watch it drunk: Tucker and Dale vs. Evil is a hilarious and well-constructed film in its own right, but my one criticism of it (aside from the usual gee-look-at-this-lack-of-interesting-female-characters, which is just par for the course) is that the surprise twist ending isn’t really all that surprise or twisty…unless you are drunk. If you are drunk when that ball drops, it will either blow your mind, or have you giggling like a four-year-old at the sheer inanity of it, or both. Plus, the over-the-top acting is even funnier when you’re drunkenly mimicking it yourself. The drinking game: Drink for horror movie tropes. They’re packed in there like kids on a school bus. Bonus: Drink for blood splatter. Where it’s available: It’s on Netflix! P.S. This movie is particularly fun to watch as a double-feature with Cabin in the Woods. They go together like cheese and wine, because I’m full of corny metaphors today.